I spotted these Natralia Nourish Naturals products at Watsons and decided to give them a shot even though I no longer suffer from any skin issues now. I like the fact that they do not contain any sulfates, parabens, fragrances or artificial colors and I wanted to find out how they fare compared to Ego QV Wash & Skin Lotion as they are said to be formulated for dry, sensitive, rough, itchy or flaking skin as well as skin prone to eczema, psoriasis and dermatitis. 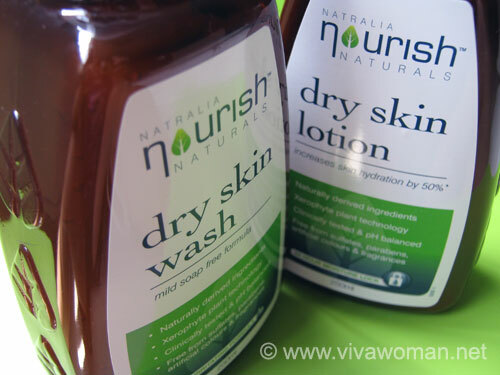 Natralia Nourish Naturals Dry Skin Wash and Lotion are made from naturally derived ingredients including a Xerophyte plant extract, known for its immediate hydration ability. Although it was not indicated on the packaging, but I also found the products to be pH balanced upon testing them with pH test strips. Ingredients: Aqua (water), cocamidopropyl betaine (coconut), glycerine (vegetable), decyl glucoside (corn or potato starch and coconut), hydroxypropyl starch phosphate (corn), lauryl glucoside (vegetable based), benzyl alcohol (jasmine or almond oil), stearyl citrate (vegetable based), salvia sclarea (clary sage) extract, citric acid (citrus fruit), dehydroxanthan gum (corn or soy), sodium hydroxymethylglycinate (amino acid derivative), propanediol (corn). Natralia Nourish Naturals Dry Skin Wash is a mild and soap free formula that thoroughly cleanses, without stripping the skin of its essential oils. It kind of reminds me of Cetaphil as it does not lather up and has a very mild scent. The hydration isn’t very apparent to me but I noticed that my arms are not as dry after bathing with this. 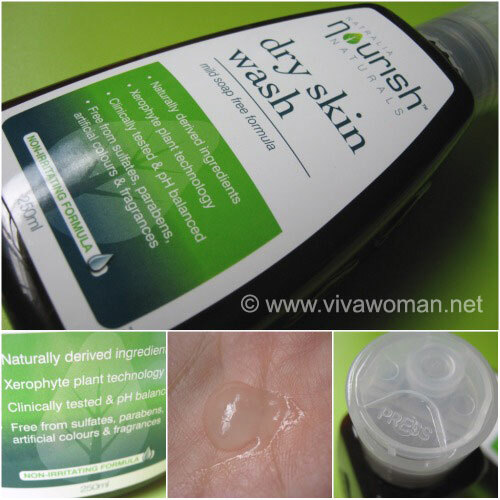 I also tried using this Natralia Nourish Naturals Dry Skin Wash on my face and I was quite pleased with how cleaned my face felt without coming across as taut or drying. I can’t say I love this but I forsee myself using this sometimes and perhaps using it on my boy too. Ingredients: Aqua (water), caprylic/capric triglyceride (coconut), glycerine (vegetable), cetearyl alcohol (coconut), glyceryl stearate citrate (vegetable), glyceryl stearate (plant derived emulsifier), cera alba (beeswax), salvia sclarea (clary sage) extract, simmondsia chinensis (jojoba) seed oil, magnesium aluminum silicate (clay), xanthan gum (glucose), propanediol(corn), caprylyl glycol (coconut), 1,2-hexanediol, tropolone. Okay, I gotta say I like this quite a lot! Like the Natralia Nourish Naturals Dry Skin Wash, this lotion is made from naturally derived ingredients including the Xerophyte plant extract, and is stated to provide intensive moisturizing. The lotion looks thick and creamy but yet, is not greasy upon application. In fact, it dries up pretty quickly. Hence, only a small quantity is required to moisturize. Unlike Ego QV Skin Lotion that comes with dimethicone, Natralia Nourish Naturals Dry Naturals Skin Lotion comes with beewax and hence, I did not use it on my face. 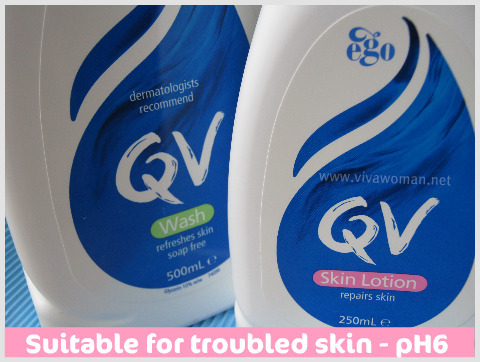 I have to say that Ego QV lotion feels more hydrating upon application, and makes my skin feel smoother. However, I like this Natralia Nourish Naturals lotion better because of its formulation. But bear in mind that I currently do not have much skin issues except that my arms are pretty dry after showering and this lotion does a decent job of keeping them comfortably moisturized without leaving a sticky residue. You might like Natralia Nourish Naturals Dry Skin products if you are suffering from minor skin conditions and like your products to be more naturally formulated. However, I suspect that those with more serious skin troubles and who have tried other products such as those from Ego QV might find this range to be average in terms of performance. I say this because my husband, who is an avid Ego QV user told me so. 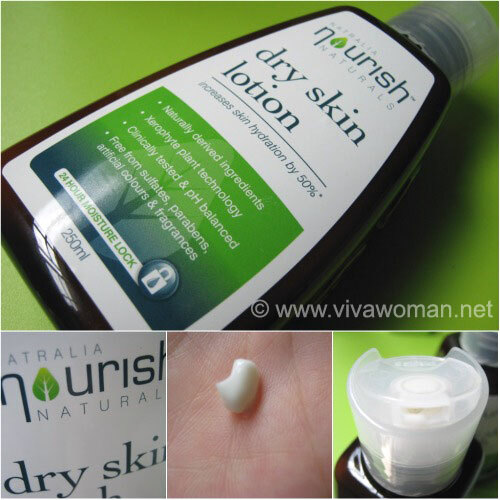 Personally, I like the Natralia Nourish Naturals Dry Skin Lotion quite a bit though because my skin is behaving quite properly now and I think it does a better job than my current body lotion as the hydration last as long as I do not wash the lotion off. So I would recommend this to those looking for an affordable body lotion and do not mind that it is scent-free. 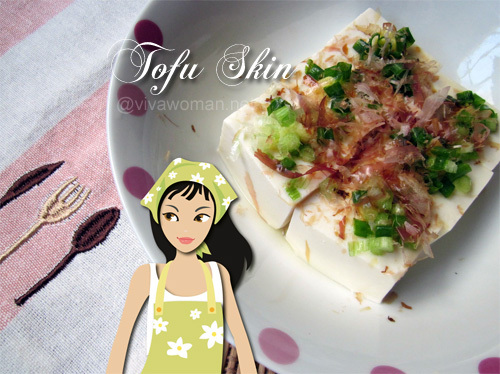 Ego QV Wash & Skin Lotion: for troubled skin Beauty Kitchen: chilled tofu dish to nourish your skin Want To Stop And Smell The Roses? Try REN Moroccan Rose Otto Body Wash And Body Lotion Share: do you wash your hands for skin’s sake? That sounds great. I also have a bit of uncontrolled dryness on my arms. Maybe that will do the deal. It relieves the dryness on mine. I like that it does not feel sticky. Awesome! Thanks for this review 😉 I should prolly try it on my dry arms too, especially after shower. You’re welcome. It’s nice on my arms…feels just comfortable and not overly moisturizing. Hope you’ll like it too. Hi there, can QV skin lotion be used on the face or is it for the body only? 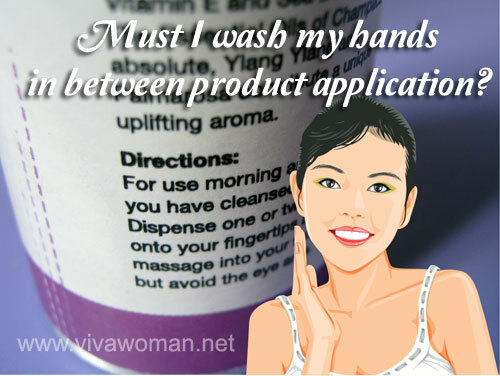 The product is specificially for the body but they have products for the face too. Nice! I would like to purchase this. ^^ My skin is so dry since i work in an air conditioned office everyday. Btw, which Watsons did you spotted this products? I got it from Compasspoint. But it’s also available at Guardian. who is the distrubtor in South Africa.